January 2019 How many Young Doctors does it take to change everything? There are now 1,200 Graduate Young Doctors bringing pride to their communities. Next year they will be joined by the Jawoyn and Dagomon kids in Katherine and even more projects in South Australia and Victoria. One manager said “This has given me back my oomph”. In 2018 there were six South Australian projects - co-funded by AnglicareSA. In Kempsey, where there are more than 450 Dhalayi Doctors, six projects ran and there were five in Melbourne. 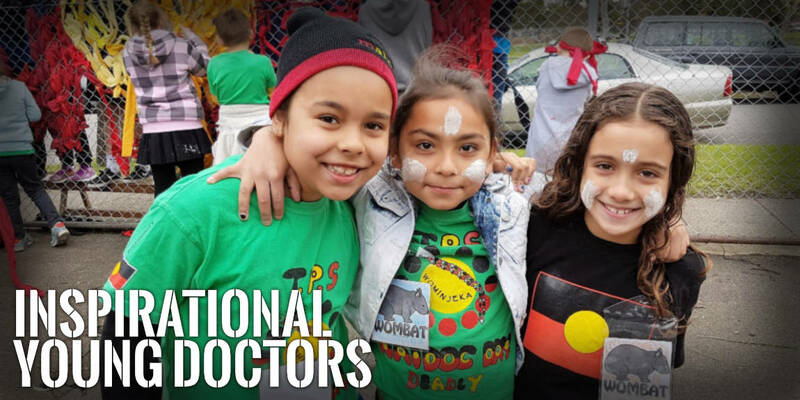 Booris Doctors in Berkeley Heights and Ngargin Doctors at Barrack Heights continue the long record in Yuin Country while there were nearly one hundred Namadgi Doctors who graduated in the ACT. So many proud Young Doctors, parents, carers and leaders taking control of their health future. The endless and welcome refrain we hear from school principals is “When it is the Young Doctors Day, we get 100% attendance – even on Fridays!” “Cop that for change!” - as Malpa Ambassador, Uncle Jack Charles says. Hands up if you like it? August 2018 “We are just as excited as the kids,” says the Manager at Christie’s Beach, Stewart Allen. Following on from the project in Aldinga Beach, SA which was awarded the Governor’s Award for Children’s Week, 240 new Young Doctors will be trained in the next year in South Australia. In a landmark move Malpa and AnglicareSA are co-funding sixteen new projects in the next twelve months. The eighteen new staff have undertaken a two-day planning workshop and programs have already begun in Aldinga Beach, Blakeview, Munno Para, Salisbury Downs, and Christie’s Beach. Projects will run at levels 3 and 4 and 5,6 and 7. The managers, leaders and parents are already planning a huge mass graduation in December where 120 Young Doctors will graduate before a further 120 are to be trained in the first half of 2019. March 2018 “At Malpa we have always believed that if school is a welcoming and culturally safe place with a relevant curriculum then kids will beat down the doors to be there. But even we were surprised when a bunch of kids climbed high walls around an outdoor space where the Bubup Doctors do their thing. “Can we join in?” they said. Kids breaking into school to learn! Where will that sort of behaviour end? 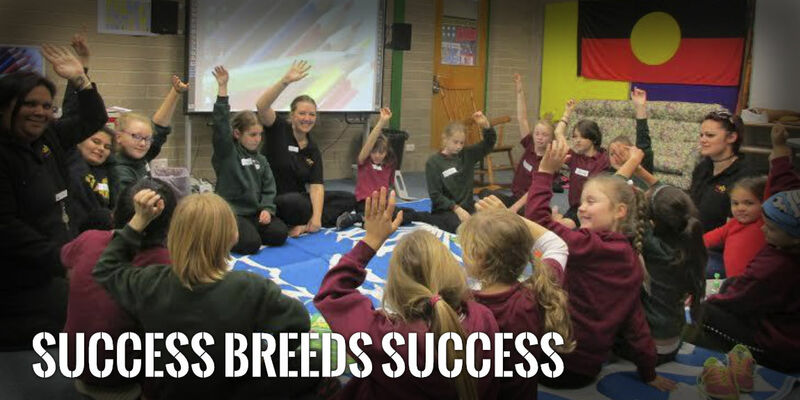 “We were thrilled that they were so keen”, said Wiradjuri/Dja Dja Wurrung/Yorta Yorta manager Shara Graham. “Everyone seems so pumped”. January 2018 Our first project in 2012 trained twelve Young Doctors (a Tji Tji Doctor pictured) from the Warlpiri Camp on the edge of Alice Springs. Dr Clint Churchyard (pictured) taught western medicine to the young people. 2017 marked a milestone for Malpa with the 1,000th Young Doctor being trained. Communities will train around 800 more in 2018. 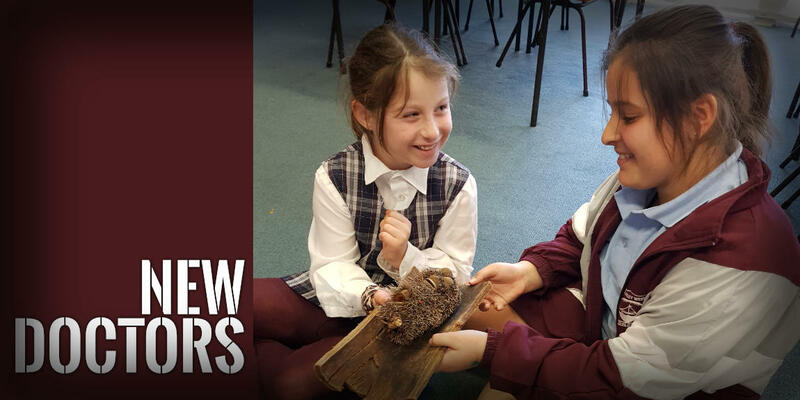 The latest move for Malpa is following our YDs from grades 3 and 4 into grades 5 and 6. 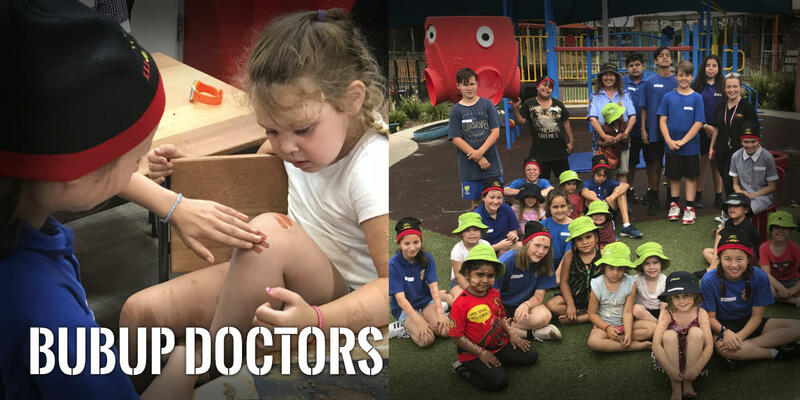 Several locations have already started this process and we hope that not only will it mean they get to know so much more and develop their leadership skills, but they might just get an appetite for a career in medicine..
December 2017 The Bubup Doctors in Melbourne recently took their new knowledge to the Yaperra pre-school. 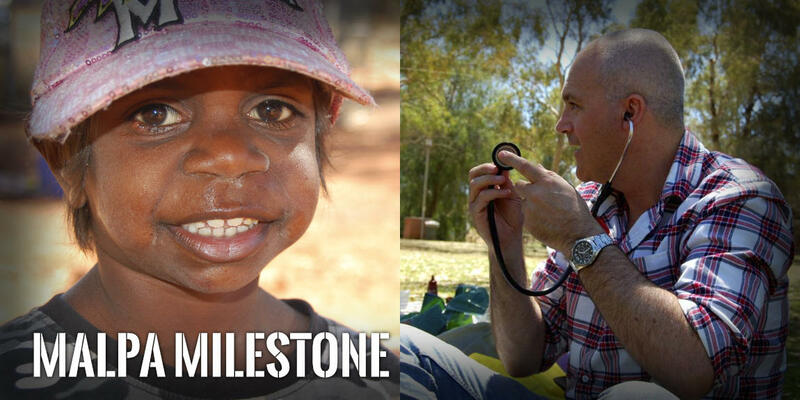 They had a real taste for being leaders helping the toddlers learn simple hygiene ticks like nose-blowing and face washing (the foundation of preventing the raft of chronic disease which impact profoundly on adult Indigenous Australians). Manager Shara Graham said “The most exciting part for me was when the Bubup Doctor’s taught the children how to use ochre to paint up for ceremonial dancing”. The children even learned how cuts and abrasions were traditionally dealt with and how to use bandaids for protection. The Bubup Doctors also showed how good food choices make a for a long and healthy life. Their enthusiasm was truly infectious. November 2017 “I was holding a heart in my hand!” exclaimed one Young Doctor with a mixture of fascination and surprise. “And then a kidney!” Down in East Gippsland forty Dala Mala Malung Doctors attended a weekend camp to encourage careers in medicine. 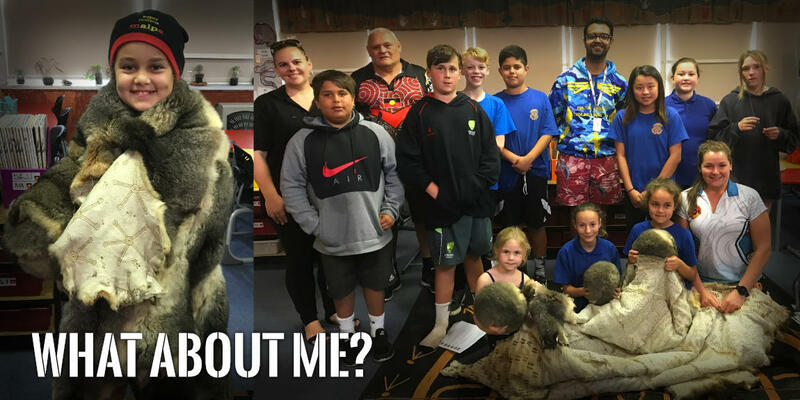 Lead by Dr Jane Greacen and Aunty Doris Paton and supported by Elders, doctors and paramedics, the young people became certified practitioners of CPR and learnt about diabetes and much more. It was a weekend to remember. October 2017 Young Doctors across three states and the ACT have just celebrated their half-Graduation. 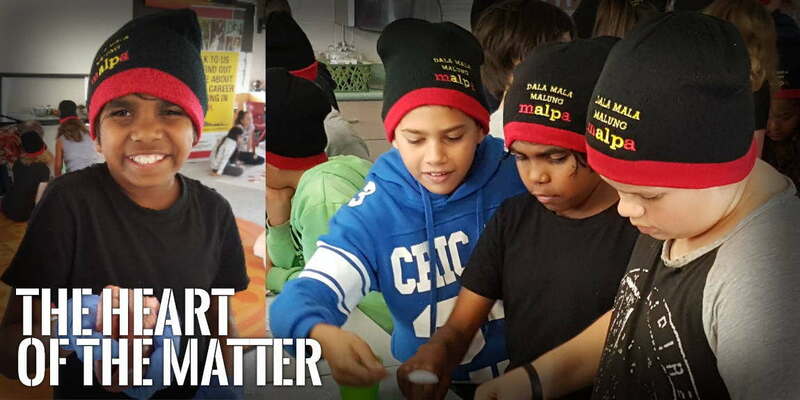 “The kids have had a wonderful learning experience together and it was great to have parents along to the half-Grad” commented Karly Lloyd, the Malpa Manager and Aboriginal Education Officer at Berkeley West. Congratulations to all the Boori, Dhalayi, Ngargin and Bubup Doctors. They join hundreds of others already making their communities stronger, healthier and more proud. July 2017 Malpa is proud to have Dan Greene as the Leader of the Namadgi Doctors at Namadgi PS working closely with The Smith Family’s Karen Parter and Mel Bulger in the ACT. 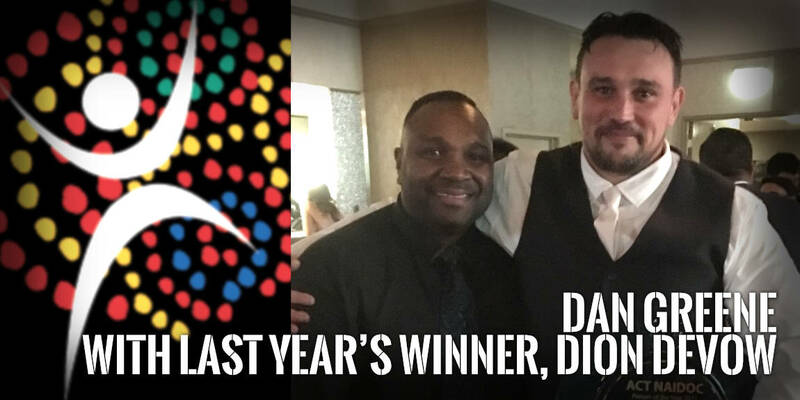 His citation includes the following: Dan is a proud Alyawarre man (Utopia, NT) dedicated to helping Aboriginal and Torres Strait Islander kids develop a powerful sense of identity and helping them to learn about culture from Elders and other members of the Aboriginal and Torres Strait Islander community. In recent years, at Namadgi School, he has continued to strengthen his efforts for Indigenous students and families through the development of partnerships with the school and numerous organisations such as MALPA, The Wirrapanda Foundation, Gugan Gulwan Youth Aboriginal Corporation, The Smith Family, Australian Indigenous Doctor’s Association (AIDA), Greening Australia and The Congress of Aboriginal and Torres Strait Islander Nurses and Midwives (CATSINaM). June 2017 “Absolutely fantastic!” was how one Ngargin Doctor described their visit to their local Aboriginal Medical Service. 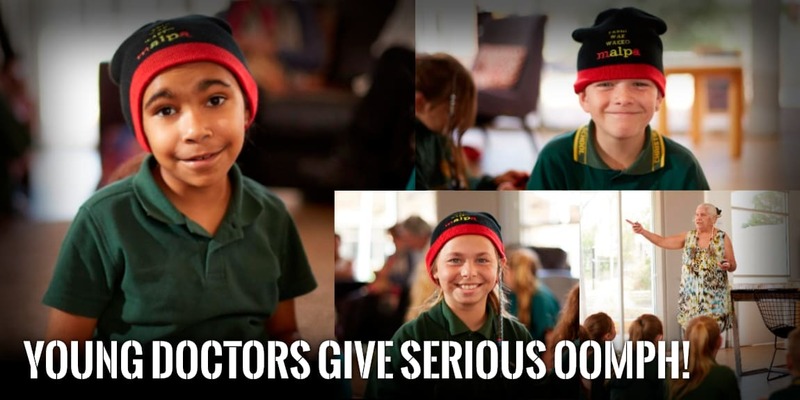 “What the AMS staff addressed was exactly what was needed for our Young Doctors” according to the Ngargin Doctor leader, Troy Tungai. The Barrack Heights group started by having their teeth were checked. 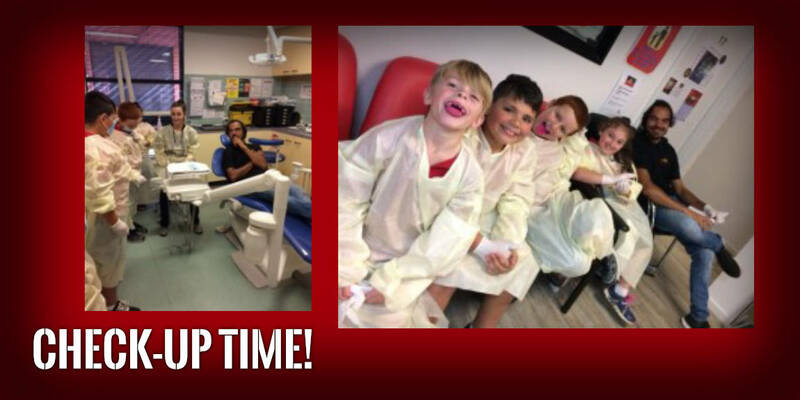 They mounted a high-tech chair and had their teeth looked at while their friends played Dental Assistant by monitoring, spraying water, blowing air into their mouths with a special hose. Another group brushed their teeth with a special pink goo. It helped show the Ngargin Doctors if they needed to brush more and if their teeth were nice and healthy. Then they played a game guessing the sugar content in the products that were in our given bag. That was an eye opener. “Ten teaspoons of sugar in every can! Yuk” Then everyone had their heart rate monitored before and after doing star jump exercises. “I can honestly say that we do have a lot of kids with a lot of energy, but they are healthy just the same” Troy commented. Then a doctor checked everyone’s ears to see if they were hearing well and showing kids the insides of their ears on a computer screen. One group was joined experienced nurses doing basic First Aid. The kids loved wrapping their mates up in bandages and they knew why and when they had to do it. They were even more excited to walk back to school with an “injury”. The day was a huge success. The AMS staff were spot on, they used kid-friendly language and the content was precise, as well as relevant. Thanks AMS staff. You rock. August 2016 It’s the start of the season for graduations and we are pleased that over 120 enthusiastic, trained Young Doctors will join the more than 600 other Young Doctors who have graduated in four states and two territories. Together they keep making a real difference in their community and their parents, Elders, leaders, Uncles and Aunties and school mates are proud of them all. 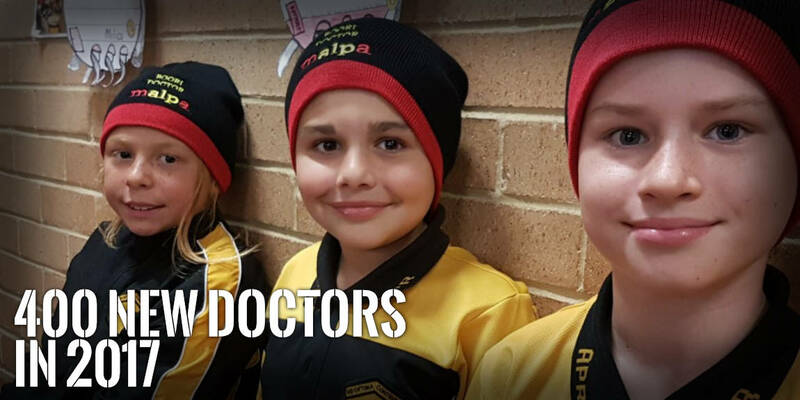 November 2015 More communities are joining the Malpa mob – Boggabilla, Toomelah, Berkeley (NSW) Elizabeth (SA) and others in Victoria are exploring the Young Doctor approach They join communities where we have worked for years. In 2017 we will train 400 more Young Doctors. One community is negotiating to have a visit from the Air Ambulance helicopter. Inspirational. We are proud to continue working with our partners at The Smith Family and Relationships Australia. October 2012 In the foothills of the beautiful Namadgi Ranges south of Canberra, sixteen Young Doctors are in training. “The social and health problems that impact on the lives of Indigenous families and children are not confined to the remote Northern Territory but are very real right in the urban heart of our nation,” according to the project Manager, Karen Parter, a Kalkadoon woman from Mt Isa. Working with project leader Daniel Greene, an Alyawarra man from Utopia in the NT, and supported by Mel Bulger, a Brungle woman from Tumut, they have exciting things planned and are working closely with the Namadgi PS to make a real contribution to improving student engagement and empowerment. The project is generously supported by The Smith Family, The Funding Network and the Aspen Foundation. 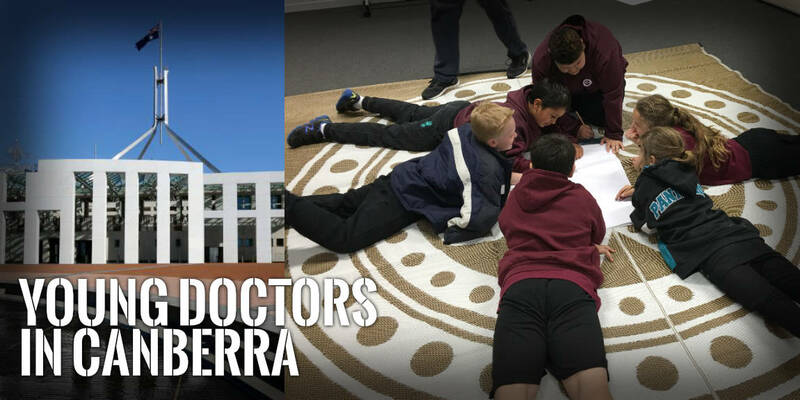 Plans are in train to start more Young Doctor projects in the ACT. 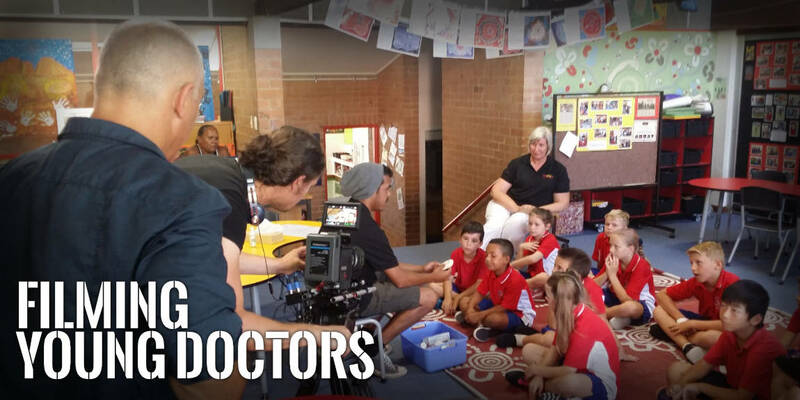 September 2012 The Ngargin Doctors at Barrack Heights are to feature in a new documentary about the effects of otitis media (OM), commonly known as glue ear, on Indigenous kids across Australia. Government statistics suggest that up to 91 % of Aboriginal and Torres Strait Islander children are afflicted with the condition which leads to life-long deafness if not treated. OM means kids can’t hear, can’t learn, can’t get job and often get locked into chronic ill-health and even incarceration. 83% of Indigenous men in NSW prisons are functionally deaf because of untreated OM in their childhood, according to a recent government report. The director of the documentary, Steve Pasvolsky, was inspired to produce the program after being shocked by how much this was impacting on Indigenous kids and the inadequacy of government the response. The program not only highlights the problem but looks at solutions and Steve believes that the Young Doctor program is making an important contribution. In the recent Closing the Gap report there was no mention of the problems surrounding otitis media.